NTG has been configuring, implementing, integrating and optimizing its own VoWiFi solutions as part of building and upgrading wireless broadband quad-play networks with native phone dialer solutions. Telecom and ISP operators are enjoying significant advantages in coverage and capacity increase by implementing NTG’s Cost Effective, true Native VoWiFi App which enables voice in WiFi for smart phones and androids. Telecom and ISP operators are enjoying significant advantages in coverage and capacity increase by implementing NTG’s Cost Effective, true Native VoWiFi App which enables voice in WiFi for smart phones and androids. NTG provided VoWifi MMTel solutions are keeping our customers ahead in competition. Especially, NTG’s indoor (including undergrounds, ferries, trains or busses) -enhancing-coverage and expansion solution provides an edge to operators since 80 percent of calls are in-building, more than 95 percent of smart phones include Wi-Fi-capable radio and 30 percent include IR.51. Business Cases: Enabling voice to call anyone-anywhere, SMS and data services over WiFi Access, accelerating service uptake by automating android terminal availability for higher customer base, supporting OTTs through standard native services, supporting operators in maintaining 3G/4G/5G networks supplementary, enhancing regulatory services, support Native Dialer with logs & PhoneBook, support GSMA VoWifi standard, interwork with Ericsson, Huawei and other IMS suppliers. 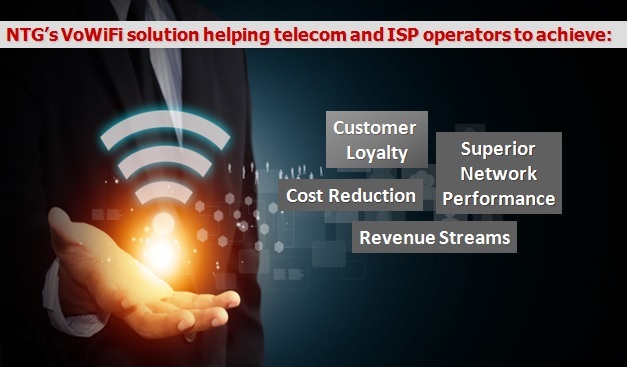 Network Performance: enhanceIndoor coverage, reduce the cost of new femto cell integration, Capacity offloading, innovative IMS telephony services over WiFi, cheaper roaming services. Smart Phone & Android Solutions: NTG VoWiFi helps operators to serve all their Android users with true native WiFi-calling experiences which includes but not limited to: originate and terminate calls, send and receive messages with attachments (location, contact, and photos), conference calls, video calls and others. · VoWiFi App for native experience on Andorid4.0 and above smart phones. Customer loyalty, Superior network performance, New revenue streams, Virtual operator, VoWiFi calling adaption, Call cost reduction and Network coverage expansion utilizing WiFi networks.